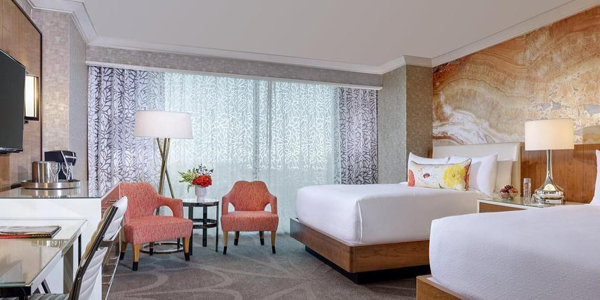 With its all-suite boutique offering, Mandalay Bay Resort Las Vegas brings the effortless style and unparalleled service of the original South Beach to the energy and buzz of the Las Vegas Strip. Mandalay Bay Resort Las Vegas fuses personalized service with a high-end design concept. The resort evokes luxury with an unexpected touch of individuality, creating an intimate experience within the grand 43-story golden tower at Mandalay Bay Resort Complex. Defined by style and sophistication, Mandalay Bay Resort Las Vegas brings a world class resort to the famed Las Vegas Strip, appealing to the most discerning travelers from around the globe. Mandalay Bay Las Vegas is an understated, all-suite retreat just steps away from the action of the strip. Mandalay Bay Resort ushers in a fresh sense of discovery and sophistication that complements the New Las Vegas experience. Featuring a clean color palette of whites and neutrals, the 725-square-foot suite incorporates it's iconic window sheers, crisp white linens and oversized tufted headboards, updated with playful gold accents for a bold and modern touch. Each suite features a private bedroom, a spacious spa-style bath, and separate living room with its own powder room.